With Christmas a distant memory (well almost) it’s time to turn our attention to the next big event on the calendar, and no not New Year, I mean the Spring ’15 release of course. The key dates for the Spring ’15 release are outlined here, the detailed rollout schedule can be found in the usual place. This post outlines selected highlights related to the Force.com platform (in no order of significance). On the “Report Run” page a Subscribe button now appears that enables end users to subscribe to notifications relating to the metrics provided by the report, i.e. KPI1 greater than 100, send an email etc. 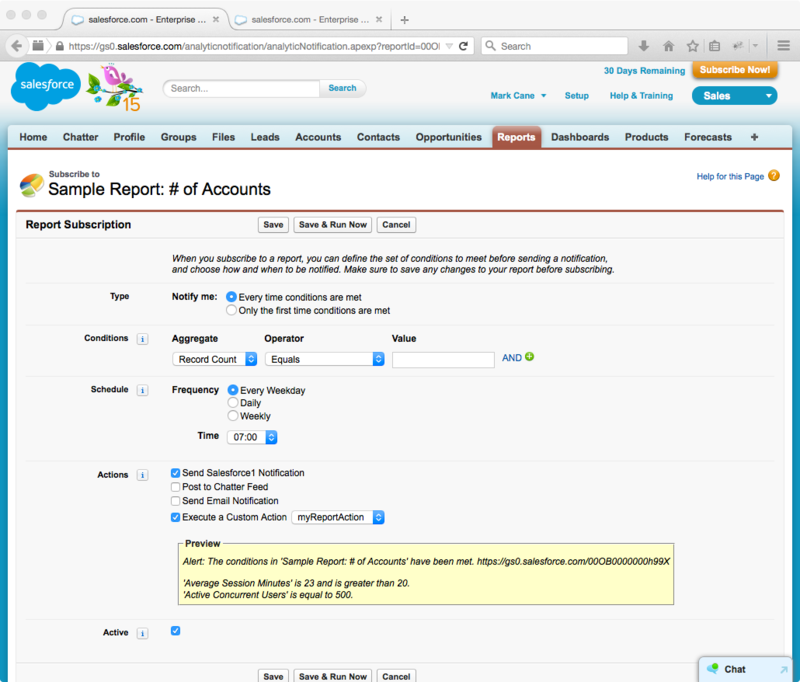 Notifications can be scheduled in a flexible, recurring manner with the resultant action set to a Salesforce1 Notification (via the mobile app), Chatter post, email notification or Custom Action. In the latter case an Apex Class can be introduced which implements the Reports.NotificationAction interface. The class above appears as an option for the “Execute a Custom Action” selection on the “Subscribe to..” page. Test setup methods create test data for the test class as a whole. Annotated methods are executed first during test execution to create the test records – each constituent test method gets access to the same original set of records regardless of the DML operations of preceding test methods. This approach removes the test data creation and rollback operations from individual test methods, thereby reducing test execution time and removing the consumption of governor limits within test methods due to test data creation. Standard address fields now support inline map presentation. This is configurable and limited to Google as a map service provider. The Lightning Process Builder is unavailable during the pre-release programme, however the product will be GA on release. My general interpretation of the positioning of the 3 platform workflow capabilities is provided below for information only. – Workflow: single-object centric collection of ungrouped rules and actions, auto-invoked via data modifications. – Visual Workflow (Force.com Flow): multiple-object business process orchestration involving user interface elements for data capture and manual-invocation of logic*. – Lightning Process Builder: single-object centric, visual composition of multi-step processes, auto-invoked via data modifications. Records can be created and cross-object updates applied to any related records not just the parent in a master-detail relationship. Note, there are differences between the beta version of Process Builder and the GA release. For example, Apex code can now be called directly from a Process, and Processes can be versioned for change tracking purposes (up to 50 versions, but only 1 can be active). Two new standard objects LoginEvent and PlatformEventMetrics enable identification of suspicious login patterns, such as unusual login times, IP ranges, above-average login behaviour etc. 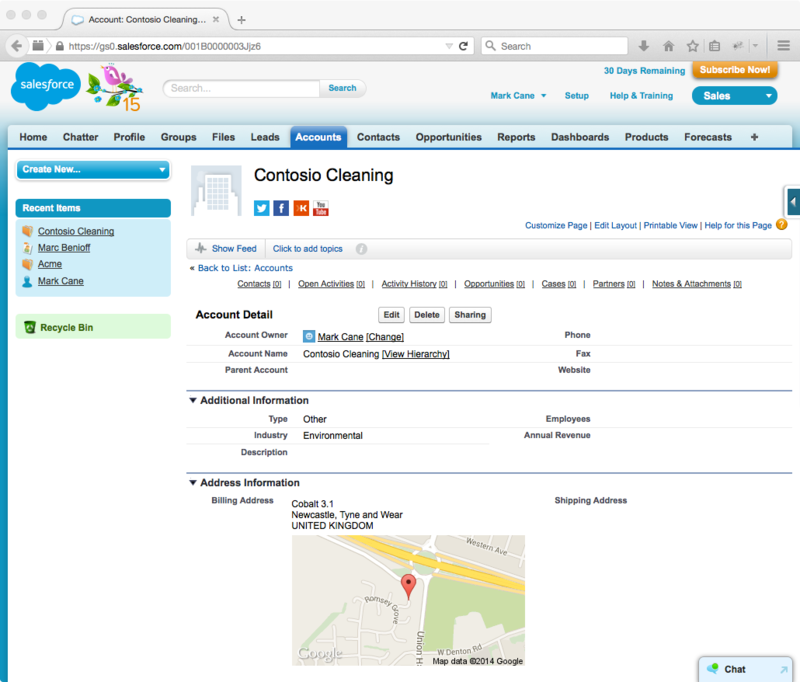 To avoid fraudulent activity a Salesforce security plan should be proactive in auditing login patterns over time. Named credentials bundle together the configuration details for an authenticated Apex callout; endpoint, authentication type and credentials are stored together as a single configuration record that is maintainable via the setup menu. This replaces a common use of Custom Settings and usefully decouples the authentication coding, which is handled by the platform. Asynchronous tasks submitted via Queueable Apex can now be chained an unlimited number of times; previously the limit on the chain size was 2. This sounds useful in terms of incremental processing of large data sets, but if your technical solution design requires a significant chain size this may indicate a flawed approach. Note, the release notes suggest that DE and trial orgs are limited to a chain size of 5. New components and events have been added to the Lightning Component Framework, the restrictions in regard to authoring of components in a Developer Edition org with a namespace have also now been removed. 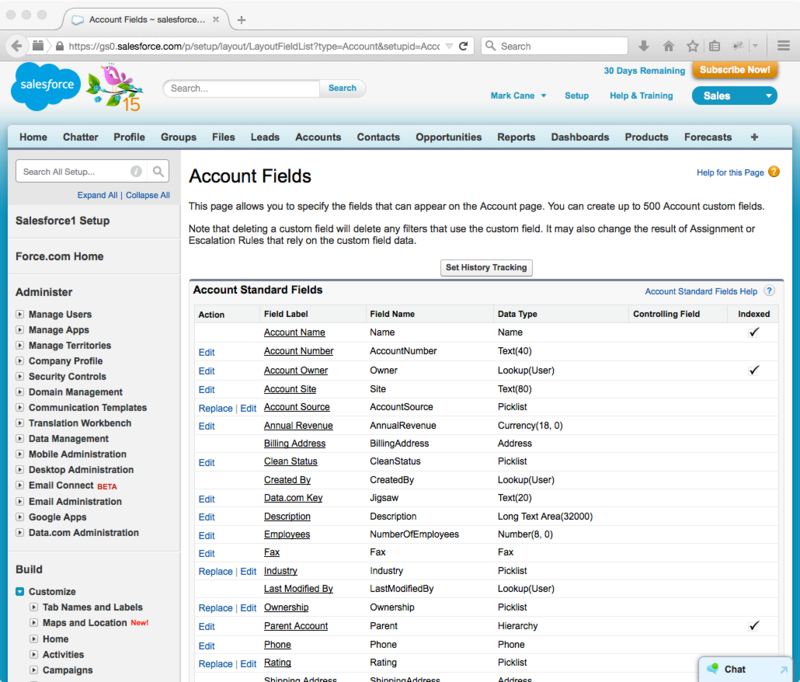 With Spring ’15 components can be configured to run within the Lightning App Builder and Lightning Pages, although the former remains in a closed pilot. Case Feed users can now reduce time performing repetitive tasks by executing, via a single-key click, pre-defined macros. Macros are comprised of instructions such as selecting an email template and sending an email to a customer. In practice a library of useful macros will greatly increase Support Agent productivity whilst ensuring standardised support processes are adhered to. The macro functionality seemed to be missing from my pre-release trial org – I suspect the functionality is related to the Lightning Process Builder which is also omitted. A very useful additional column on the Fields page for Standard and Custom objects – covers standard and custom fields. An understanding of the indexes applied to an object can be key to troubleshooting reporting performance issues or to ensuring SOQL queries, list view filters etc. are defined with data retrieval performance in mind.